Arrive at Yangon International airport, meet the native English speaking guide. Transfer to check in hotel. Lunch break. Start sightseeing of Yangon city center, Sule Pagoda, City Hall, High Court, Independence monument, where you can see the bustling life of the city. 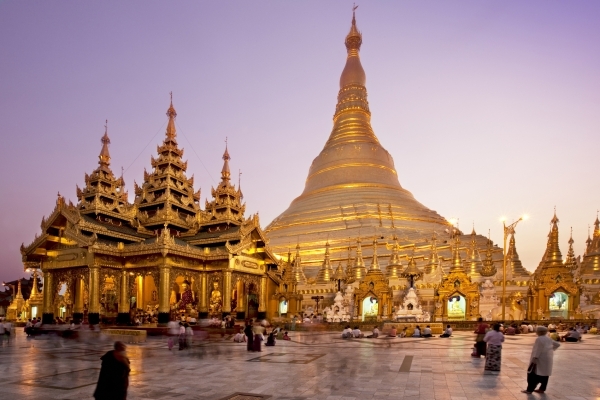 Then proceed to the well-known Bogyoke (Scott) market- the famous market of Yangon and to the most spectacular religious edifice, Shwedagon Pagoda for day break sunset. Overnight in Yangon.Remarks: Bogyoke (Scott) Market, National Museum are closed on every Monday and Government holidays. After breakfast, drive to Tooth Relic Pagoda and you have a chance to study Kalaywa Tawya Monastery, a monastery with high reputation consists of round about 1000 young novices can be seen at the same time while they have their 2nd or the last meal of the day. It is very well-worth seeing. Proceed to Swe Taw Myat Zedi (the pagoda relic replica of the tooth of Buddha) Pagoda, KabaAye (or World Peace Pagoda), Kyauktawgyi Pagoda also known as Lawka Chanthar Arbayar Laba Muni Buddha Image at Minn Dhamma Hill, there is an Elephant house where the two white elephants are kept. Overnight at the hotel in Yangon. After breakfast, free day walking around Yangon City in order to observe local people life by your own. In the evening transfer to Bus Station take the Express night bus to Bagan. Overnight on bus. In the morning arrive at Nyaung U Bus Station, welcomed by tour guide, excursion around the Bagan Archaeological Zone Heritage area and begin a comprehensive tour of Bagan including; visit to the interesting local Nyaung Oo market where you can buy some cotton clothing or local woven fabrics and souvenirs. Shwe Zi Gon; completed in 1084, noted for its glazed plaques depicting scenes from the Jatakas the prototype of later Myanmar stupas. Wet Kyi Inn Gubyaukgyi Temple; the biggest and the finest brickworks temple in Bagan. The majestic Htilominlo Temple; built in 1211 AD and one of the largest temples, noted for its fine plaster carving on the arch pediments and friezes. In the afternoon, after a visit to lacquer ware workshops; continue to Manuha Temple built by exile King Manuha. Ananda Temple, 1090 AD, a masterpiece of early period temple architecture with four huge standing Buddha Images. Overnight at hotel Bagan. After morning breakfast, visit to famous villages of Min Nan Thu and Phwa Saw, learning about lacquer and ox-cart making, here you even can try yourself. Afternoon take an excursion to main pagodas in Old Bagan: Dhammayangyi Pahto and Thatbyinnyu. Enjoy the sunset in Bagan. Overnight at hotel in Bagan. After morning breakfast, drive to Popa Mountain. Stop along the way to visit a culture of toddy palm trees, discover the collection and manufacture of sweets and alcoholic from fruits. Climb 777 steps to the top of the volcanic cone TaungKalat and visit the temple. Road to Mandalay. Overnight at hotel in Mandalay. After morning breakfast, transfer to jetty for a boat trip on the Ayayarwaddy River to Migun village about 11 km (1 hour) upriver from Mandalay, visits the huge Pa Tho Daw Gyi: - One of the world’s largest unfinished monument built by King Bodaw Paya. Mingun Bell: - weighing 90 tons the world biggest bronze bell, and visit Mya Thein Dan Zedi . And then visits the Amarapura sightseeing’s famous Maha Gan Da Yone Monastery. Proceed to the1.2Km long U-Bein teak bridge which was recuperated from the waste of abandoned Ava palace, Wood carving, Marble carving, Bronze casting. Lunch Break: return to visit Maha Muni Bronze Buddha Image: - A spectacular Buddha image of Rakhine feature, Gold leaf processing method, Shwe Nan Daw Kyaung:-(Golden Royal Palace Monastery) a traditional teak architect handicraft design, Ku Tho Daw Pagoda:- known as the world' s biggest Buddhist scriptures book, consisting of 729 marble slabs, Tapestries & Silk weaving of Mandalay. Then Sunset from Mandalay Hill. Overnight at Hotel in Mandalay. After morning breakfast, drive to Pyin Oo Lwin or Pyin U Lwin, formerly and colloquially referred to as Maymyo, is a scenic hill town in Mandalay Division, located in the Shan Highland, some 67 kilometers east of Mandalay. Arrival there, visit the beautiful Botanical Garden, National Races Villages, Pwe Kauk Waterfall, Peik Chin Myaung cave, one of the most attractive in Myanmar and home to many Buddhist images. We trek down to hidden waterfalls and swim in the lagoons. Further down the walkway is a small market selling local souvenirs and handicrafts. Return back to Mandalay, overnight at hotel in Mandalay. After breakfast, transfer to airport and fly to Heho. On arrival continue by coach to Nyaung Shwe, the gateway to Inlay Lake, which situates 900m (above sea level) for the home of unique one leg rower. Explore the beautiful landscape floating market, floating gardens, conical fishing method, famous Phaung Daw Oo Pagoda, Nga Phe Kyaung (Jumping cat) monastery - a beautiful collection of antique Buddha statues, Silver smith designs of Inle by boat. Overnight in Inle. After breakfast at hotel, drive to Pindaya Caves, these caves are ensconced in a limestone ridge overlooking the lake. Inside the cavern there are more than 8000 Buddha Images-made from alabaster, teak, marble, brick, lacquer and cement and are arrange in such a way as to from a labyrinth throughout the various cave chambers. Lunch at the local restaurant. Then proceed to Shwe U Min Paya. This is a cluster of low stupas just below the ridge near the Pindaya Caves. You can also explore the district for famous traditional paper and its umbrella making home base cottage industry. After that drive to Kalaw ( known as Pine City ), 1320m above sea level. A peaceful summer resort with fragrant pines and misty blue mountain ranges. Famous for its unique trekking area in Myanmar, where our ethnic groups Palaung, Pa-o, Danu, Taung Yoe exist with their own traditional culture. Kalaw stands high on the western edge of the Shan Plateau. This was a popular hill station in the British days and it is still a peaceful and quiet place and you will find reminders of British colonial times. Overnight at the hotel in Kalaw. After morning breakfast drive back to Heho Airport from Kalaw, then fly back to Yangon. Welcomed by our driver at Yangon Domestic Airport, transfer to hotel in Yangon. After breakfast, drive to Kyaikhtiyo (The Miracle of Golden Rock) is a well-known Buddhist pilgrimage site in Mon State. It is a small pagoda built on the top of a granite boulder covered with gold leaves pasted on by devotees. According to legend, the Golden Rock itself is precariously perched on a strand of the Buddha's hair. The balancing rock seems to defy gravity, as it perpetually appears to be on the verge of rolling down the hill. The rock and the pagoda are at the top of Mt. Kyaiktiyo. Arrive Kin Pun base camp, proceed to top of mountain by the open truck., which are very crowded. From the “upper area”, travelers must at present walk the final stage, approximately 4 km up steep paths, which ascend some 500m to the Golden Rock. As an easier alternative to walking, visitors can be carried in sedan chairs by four porters at an extra cost, overnight at Golden Rock. After morning breakfast, drive back to Yangon, then visit to Bago on the way, do the sightseeing includes “Kanbawzathardi Palace” the famous palace of King Bayinnaung (1551-1581 A.D.) is being extensively excavated and some buildings are being rebuilt. “Shwe Maw Daw Pagoda” was originally built by the Mon to a height to 23 meters in the 8th century and was rebuilt higher several times until it finally reached its present 114-meter stature in 1954, the highest pagoda in Myanmar. “Shwethalyaung Pagoda” Built in 994 AD by King Mingadippa, It is 55 meters long and 16 meters high, another biggest reclining Buddha image in Myanmar built during 9th century. “Kyeik Pun Pagoda” It was built by King Dhamma Zedi in 1476 A.D, four gigantic Buddha images all in sitting posture facing the four cardinal points of the compass. Overnight at hotel in Yangon. After morning breakfast, transfer to Yangon Domestic Airport, fly to Thandwe. Welcomed by our driver and transfer to hotel in Ngapali beach. Overnight at hotel in Ngapali beach. After breakfast, free & leisure on the beach till noon, then transfer to Thandwe Airport, fly back to Yangon. On arrival, welcomed by our driver transfer to hotel in Yangon. After breakfast, depending on your departure flight, transfer to Yangon International Airport in order to catch your departure flights.